I’ve recently started calling our diaper bag the bag of tricks. This is because I’ve discovered that by having a few simple items with us at all times, we can keep our little guy relatively entertained even when it seems impossible. These items have been great for going out to eat or in situations where we find ourselves waiting for one reason or another. Like anything in the world of parenting, it’s not completely fool-proof, but it definitely helps a lot. I thought I’d take a few moments today to share some of the items we like to keep in our diaper bag. There are days where all of these items are in the bag and other days where only a few are in the bag. Our little guy is quite curious and enjoys taking things out of the diaper bag when we’re at home. Sometimes things don’t always make it back in to the bag. Many restaurants have a coloring section on their kids menu. 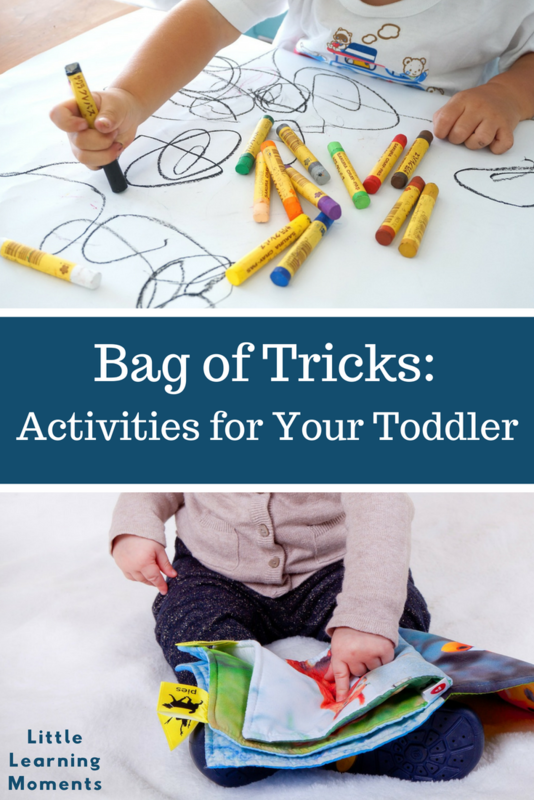 This is great because it immediately gives you an activity that your little one can do. However, these same restaurants often give you two crayons to go with the menu. This makes coloring a lot less fun, especially if one of those crayons is a yellow. This is why I recommend keeping a full pack of crayons in your bag. I personally like these jumbo crayons from Crayola – especially for tiny toddler hands. 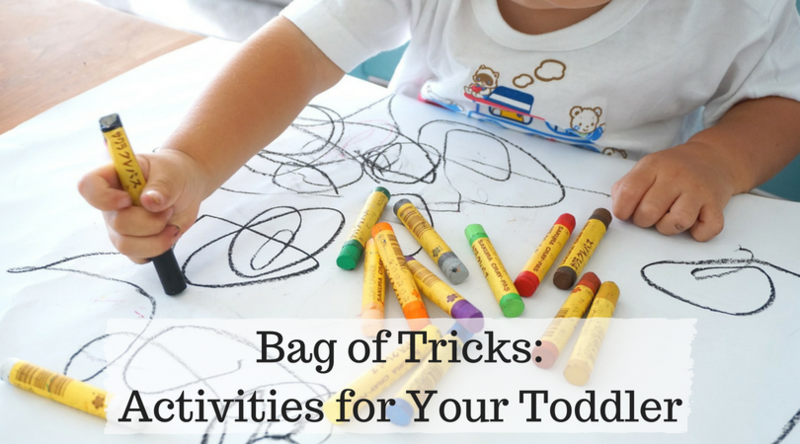 You could also throw a notebook in your diaper bag for those situations when you might not have paper nearby. Books are something that always make my list for an activity. We have a couple of stroller books in our diaper bag that can be clipped on to strollers, carts, or even high chairs. This keeps the book from ending up on the floor, while still allowing your little one to enjoy it. These can be quite handy – especially when you have a little one that loves books. We also recently discovered these nifty Water Wow books from Melissa & Doug that are perfect for entertaining a little one. These books allow you to color using water and are even reuseable so that you can enjoy the picture over and over again. It’s like a magic trick! Toys are a great addition to your bag! These will vary based on your child’s interests and abilities. You could throw in some mini figurines, cars, or building blocks to keep your little one entertained. Dollar Tree and the Target Dollar Spot are a great place to visit for these types of toys. Then, you don’t have to worry if they get lost because you didn’t spend much on them! Our Sophie the Giraffe used to go everywhere with us. In fact, we kept her attached to our stroller with a sippy cup holder for a long time. This was his comfort item that went with us all the time. For some kids, it’s a familiar toy or stuffed animals. It really does vary from kid to kid. However, keeping that comfort toy along with you can help during meltdowns and naps on the go. The last thing that I always have in my bag of tricks is snacks. Little ones have small tummies and eat way more often than we do as adults. Snack can be helpful when you’re trying to run errands or when your little one is hungry and can’t wait for the food to arrive. I try to use these as a last resort, but there are definitely times where a snack has been the cure for tears! I love keeping a few helpful things in our diaper bag at all times. I’ve noticed that it cuts down on the number of meltdowns we have and that my stress level is a lot lower when we’re out and about. Baby Fox also gets a lot of compliments on how happy and smiley he is when we’re out. I don’t entertain him every second of our outings but I certainly do keep my bag of tricks handy at all times. What helpful things do you keep in your diaper bag? I’d love to hear about them below! Don’t forget to join our free Facebook group for even more ideas to do with your little one!